From gravel to sand and soil, all kinds of construction aggregate materials are in stock at Midway Lumber Company Inc. for your building and landscaping projects. All our bulk aggregate materials are available at reasonable rates. Most types are in stock and may be ordered in bulk loads for your convenience. 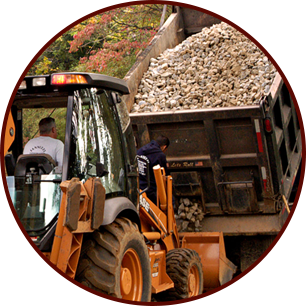 Contact us to learn more about the broad selection of aggregate and building materials we have available. Fill in pathways with quality gravel aggregate. We also have larger stone pieces suitable for xeriscaping and other applications. Be sure to order our river gravel that is ideal for water features and other installations. Whether you want to recreate the beach life in your yard or improve drainage on your property, we have the bulk sand aggregate you need. Concrete sand is also in stock when you want to mix up a smooth batch of concrete. Spread out topsoil and watch the flowers grow in your beds. Our varieties of topsoil are suitable for all kinds of horticultural applications. Once you have the soil in place, you can focus on actually growing the plants instead of figuring out what to grow them in.